Ventura, “aka Vinnie" is a medium fawn 8X Color & Reserve Color Champion. This is some of the finest, softest fiber you will find. The high frequency crimp and density is amazing. Vinnie is sired by Snowmass Millenium who is a 4Peruvian Legacy son and Millenium’s dam is a Hemingway daughter. Vinnie’s dam is an Elite Maximus daughter. She is bay black and Vinnie has produced black many times even when bred to fawn. What an amazing pedigree of Millenium, Legacy, Hemingway, Elite Maximus, Accoyo Elite and 5Peruvian Valeroso. Breed to one of the most pre-potent herd sires around today. Ventura is putting champions and blue ribbon winners on the ground at a spectacular rate! 27 banners between 12 different alpacas. 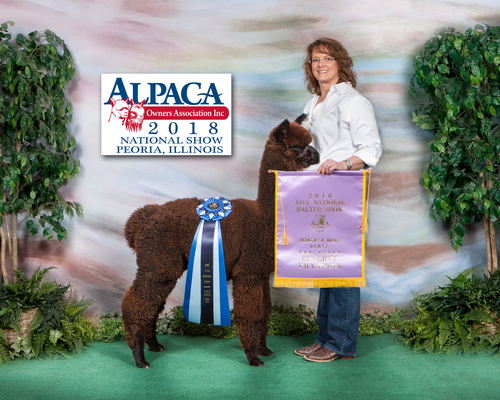 Through the 2017 show season, Vinnie has 63 cria registered with 53 that have been shown: they have already taken 69 Blue Ribbons and 51 red ribbons. 38 different offspring have taken 1st or 2nd. He has produced winners in all colors. Daughter Irish Meadows Nectar was the high selling female at the 2016 Priority Auction! Daughter OLAA WMFA Ventura's Wild Flower highest selling female at the 2016 AOA National Auction. 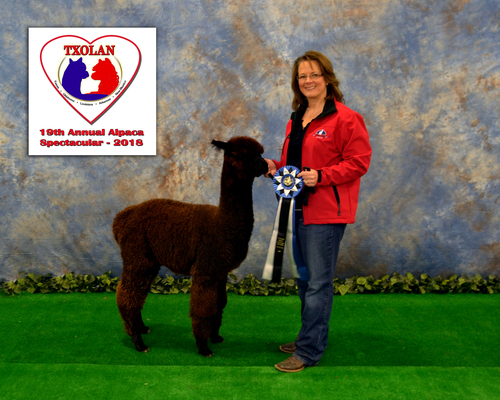 Daughter Oak Lawn Cheyenne was the 2016 AOA National Show Brown Female Color Champion. Skin Biopsy results at 3 yrs. of age: 74.86 FOLLICLES SQ MM, S/P 15.3/1, secondary fiber 16.9 microns, primary 21.6. This is an outstanding difference of only 4.7 microns! EPD's for 2017, Vinnie is in the top 1.2 % on 4 categories: Check him out. Meet a 7 time champion and a Judges Choice Champion at the large Minnesota Expo! An 8 time blue ribbon winner (out of 8 showings, 3 Color Champions and 3 Reserve Color Champions, AND ONE JUDGES CHOICE all as a juvi, this girl is something special! Ironically and much to my happiness, Sister GOLDEN Hair throws BLACK! She's already had two black females and two black males, and these cria are collecting purple!!! He's been collecting blue ribbons along the way and as a juvi won the Reserve Color Champion banner in the AOA National Halter Show.